Tossa de Mar holidays transport you a charming settlement with an ancient history on the Costa Brava, less than sixty miles from Barcelona. Sheltered by wooded hills and spread round a wide bay, this idyllic spot offers peace and relaxation. 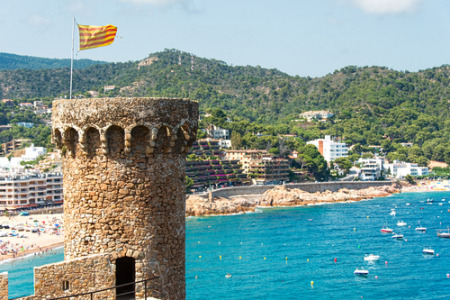 Holidays to Tossa de Mar can be taken from April to October with temperatures rising from twenty to thirty at the height of the season.With great beaches, both in the bay and further round the coast, it is no surprise that holidays in Tossa de Mar attract many families with young children. A variety of water sports are available from the beach and the waters around the off-shore Medes Islands are perfect for snorkelling and scuba diving. If you are seeking a guarantee of summer sun in an attractive resort with soft sand and warm seas, you'll be pleased to see our cheap Tossa de Mar holidays. They offer good value as our commitment to quality and service never wavers. The walled village, Villa Vella, dating from the twelfth century never fails to charm. Its maze of cobbled streets overflow with shops, cafes, bars and restaurants. A wide, varied cuisine satisfies most palates and the village is known for its superb fish restaurants. Tossa de Mar Nightlife is low key reflecting the resorts popularity with families and couples. Shopping, though fairly limited, is more than adequate for all your holiday needs, including gifts and souvenirs. If you are looking for a relaxing break with equal measures of sun, sand and sea, our low cost Tossa de Mar holidays may be just the ticket. For further information and to view our best Tossa de Mar holiday deals, please use the search facility.